Do you remember how you used to keep track of information about your customers before you started using a computer for your accounting? A file folder containing paper transaction forms and other communications? A card in your Rolodex? A list on paper? The easiest way to find these tools is to simply click the Customers tab in the navigation pane. This will take you to a comprehensive page that will eventually contain a list of your customers. To add a new customer, click New Customer in the upper right corner. Note: If you already have a database of customers in an Excel or .csv format, you should be able to import it into QuickBooks Online. We can help you make this happen. You’ll see an empty screen with predefined fields like the one above. Complete as many fields as possible can for your customer; you’ll be using this information later in transactions and reports. 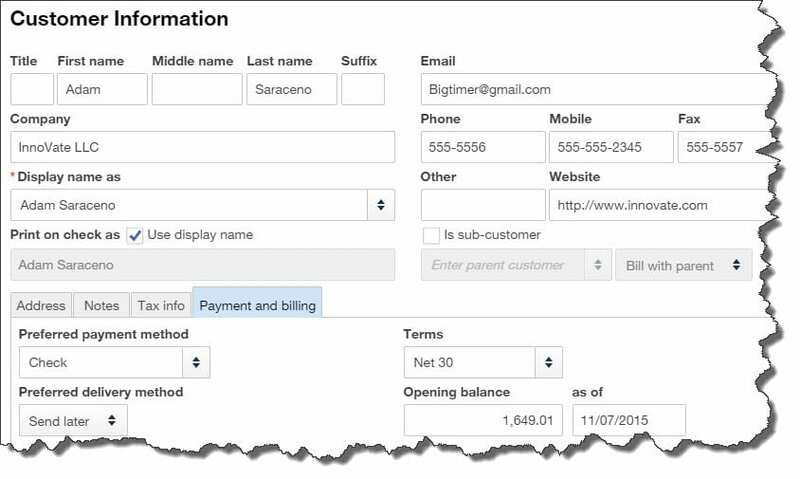 Completing the fields in the screen under the fourth tab, Payment and billing, will save you a lot of time when you start creating transactions. Any of the customer’s current, unpaid obligations should be entered in the field labeled Opening balance…as of. You can also select default (preferred) Terms, payment method (cash? check? credit card? ), and delivery method (print or send later).